Zari Zoon, a vivacious girl from Kashmir, is looking forward to marrying her fiancé when tragedy strikes. Next thing she knows, she is on a plane to America to stay with the Nabis, distant family relatives, who have offered to give her a temporary home to help her stitch back the tatters of her life . . . Billy Nabi, fiercely tender-hearted, longs to help Zari, but the choices he makes jeopardise them all . . . An Isolated Incident is a saga of haunting memories and yearnings for a lost home, of a faith continuously tested and questioned, and of a love that blossoms against all odds. Soniah Kamal was born in Karachi, grew up in London-Jeddah-Lahore, and resides in the US where she has called many States her home. Currently, she lives in Georgia where Margaret Mitchell wrote Gone with the Wind, Flannery O’Connor kept pet peacocks, and Alice Walker set The Color Purple. Soniah has a BA in Philosophy from St John’s College where she received the Susan B Irene Award, and is now pursuing an MFA from the Georgia State University where she is the 2014 Paul Bowles Fellow in Fiction. Soniah enjoys long strolls around koi ponds and doodling forests of curlicues. She cannot resist the drumbeat of a dhol and her talisman is a globe in any shape or size. Her favourite activity is time-travelling through books. Soniah has shared her life with a sandy dog, a silky cat, a sweet turtle, two guinea pigs, one long haired and one short haired, frogs as big as thumbnails, and a multitude of budgies and betta fish, red, blue, green, and yellow. She believes that kindness can change the world. 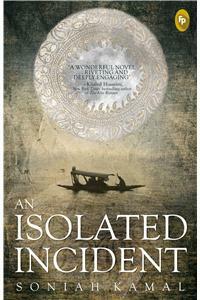 An Isolated Incident is her first novel.